Around the NBA is a new, weekly segment that will appear on Hack-a-Shaq with weekly news, standings, stats and more! 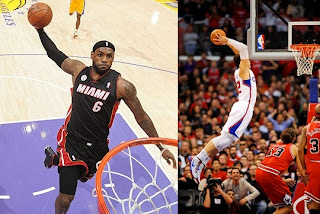 LeBron James and Blake Griffin named Players of the Week. Not much of a surprise, considering the incredible numbers both posted up this past week. James averaged 34 points per game and shot an insane 70% from the floor while keeping Miami undefeated for the week (3-0). Griffin put up 25.7 points per game, 11.3 rebounds per game and a surprising 4.7 assists per game, helping the Clippers also go 3-0 on the week, and thus claiming the Western Conference Player of the Week award. Kobe Bryant goes through 2nd practice with the Lakers. This time, Bryant went through a full, 5-on-5 practice with contact. The Lakers' star shooting guard, who sustained the injury in April, looked a lot like his former self, showing off surprisingly good handles, good vision, a nice post game and an ever improving mid-range game. Despite not yet playing above the rim, he appears to be well on track to return at the end of November, or in early December, like he said yesterday after practice. Warriors' Stephen Curry out with concussion. Stephen Curry sustained an ugly looking concussion in the fourth quarter of Monday night's win over the Utah Jazz, after the Jazz's Marvin Williams fell on his head during a scramble for a loose ball. His status is day-to-day. Curry is averaging 19.9 points and 8.7 assists. Grizzlies' Tony Allen suspended for kicking Chris Paul in the face. Yep, you read that right. Tony Allen jumped and stuck his foot out, which just so happened to strike Paul in the face during a drive to the basket. Allen was ejected immediately, as he was assessed a Flagrant 2 foul and will miss Wednesday night's contest vs. the Golden State Warriors. Bulls' Jimmy Butler to undergo MRI on toe. Butler was injured on Monday night, during a contest vs. the Charlotte Bobcats, though X-Rays revealed no damage. Butler is having himself a solid season, averaging a career high 11.4 points per game to go with 4.8 rebounds and 1.8 steals. I think the story here is the disparity between the Eastern Conference and the Western Conference. Currently, the East only has four teams over .500, while the West has a whopping nine teams over .500 and another currently at .500. If you're a fan of a Western Conference team, you are really hating just how deep the West is. The Battle of New York hasn't exactly been off to a good start, as both the New York Knicks and Brooklyn Nets are severely under performing; both have a 3-7 record. The big difference between them is the Nets were built this off season by trading for Paul Pierce, Kevin Garnett and Jason Terry, as well as completely reconstructing their bench and shaking up their team's core, while the Knicks have basically brought back the same team as last year. Though I'm sure both teams will make the playoffs and will be dangerous squads in the playoffs, how far they go, however, is anybody's guess at this point.